In a medium skillet set over medium-low heat, heat a teaspoon of vegetable oil. Once hot, crack in 4 eggs, sprinkle with salt, and cover with a lid. Cook for about 3 minutes, until eggs are set, but not fully done, and the yolk is gooey. Repeat with the remaining 4 eggs, or make two skillets at once. 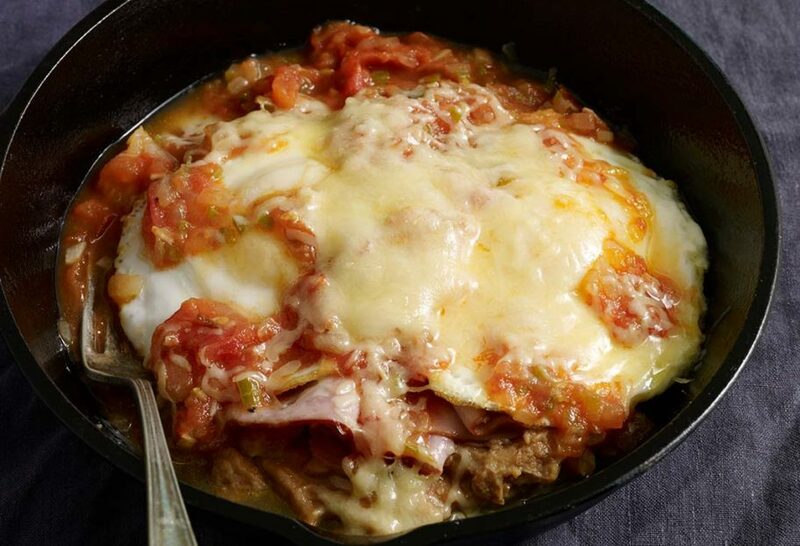 In an individual casserole, ovenproof bowl or large ramekin, spoon 3/4 cup refried beans, add a slice of turkey or ham, and a pair of the cooked eggs. Ladle in a generous amount of salsa ranchera to completely cover, and add shredded cheese on top. Assemble the rest of the casseroles. Alternatively, it can be made in a large casserole for everyone to share. Place in the oven until the cheese has completely melted, about 4 to 5 minutes. I just watched your episode with the egg casserole, refried beans, ham and eggs.. It looks so yummy.. My husband (from Costa Rica) didn’t want to watch a cooking show.. but I insisted. No regrets on our parts.. The cinnamon rolls looked to die for. And the fruit!!!! Wowwwww!! I loved your presentation!! You are adorable.. I am going to make the casserole right now. So happy to have found you, and your comfort food. My parents were German immigrants but I was born in Canada, now live in Colorado..
Aww thank you so much Susana! I’m so happy you found me too. I literally just saw this episode of had to try this. I loved that it calls for everyday ingredients in my home. I used black beans and added some pico. Delicious! This is the best breakfast casserole! Thank you sooo much for sharing. So glad you made it your own, Crystal. Hi Pati. I love your personality and you’ve taught me so many great things about Mexico and Mexican cooking. I made your baked egg casserole and my husband absolutely loves it. He gets so excited when he sees me making it. Probably like when your boys get excited when they see you making their favorite dish. Best wishes! Hi Pati, I just started watching you recently, I love Mexican food. Tons of flavor, minimal ingredients. I’m really looking forward to trying this one. I see other tv chefs cooking eggs in oil too, they are so much better in the same amount of bacon grease. After I try this dish I’ll let you know how it turned out. Love your show, thank you. Oh great! I hope you enjoy the eggs Randy. I’ve made this family style in a large casserole several times since I first saw it on your show. It is just wonderful. I like it without making any changes, but I’ve also modified it to use scrambled eggs (my family doesn’t particularly like fried) and I’ve substituted chorizo for the ham, just for fun. I made it for a work breakfast and now the folks in the office keep asking me to make it again. Thanks Pati. Gordon, I’m super happy that you, your family, and your office all enjoy it. My husband doesn’t like fried eggs either, so I was going to try scrambled too. Glad to read this tip! I’m not a morning person, so when we have fancy breakfasts like this, it is always for dinner! Looks delicious, can’t wait to try it. =) Thanks for trying it, Maren! From one Pati to another, this is such a delicious casserole. I made it for breakfast this morning. Both my husband and I sat eating and savoring the flavors. Unlike you, I really do not like breakfast, but this I will make again. I’m so happy you liked it! Pati, thanks so much for this recipe. Mine didn’t turn out as beautiful as yours 🙁 I made it in a 9×9 casserole dish w/6 eggs. I used canned black beans that I mashed up a bit, but it came out watery. My man ate half his serving, then put the other half in a flour tortilla and ate it like a breakfast burrito, lol. The presentation was pretty ugly, but it got a 7 out of 10 over all. I will try again soon. Thanks again Pati. Love your show and love to see your visits to Mexico!!! Thank you so much for trying my recipe and for your kind words! Try again with refried beans if you like them… =) Let me know how the second batch turns out! Pati, this was wonderful. We made this for dinner instead of breakfast since we like eggs sometimes for dinner and this was perfect! Only change I made was to sub four toasted corn tortillas for the meat. (I did half the recipe for two of us). It was so good and we will do this again many times. Thanks so much, Pati, for such a wonderful and easy recipe! Ecstatic you like my show, Don!!! Thank you so much for your kind words and for trying my recipes! Mi marido y yo no somos fans de los huevos fritos. Me pregunto cómo quedará con revueltos. Te va a quedar deliciosa, pero solamente ten cuidado de que le pongas a la caserola los huevos cocidos solo hasta tiernitos: no los seques mucho en el sartén porque se van a seguir cociendo en el horno. I just saw this episode and had to come get this recipe. It looks amazing!!! I can not wait to make this and the cinnamon rolls for my family one night this week. Thank you!! Hope you love it as much as we do! I enjoy watching your show on PBS in Rochester, N.Y. I made the Baked Egg Casserole for breakfast today for my husband and I this morning. It was delicious! My husband had a second helping. We both love to cook and enjoy eating a variety foods. Mexican dishes are one of our favorite’s. This was my first time trying the different layers of ingredients this recipe called for and believe me, I was not disappointed. Thank you so much, Rochetta!! You’re making my afternoon! I am going to try this. I have been spoiled because my son in law is Mexican and he and my daughter cooks authentic Mexican dishes! One my favorites of theirs is Chiliquiles..love breakfast anytime. patti’s Mexican table is one of my favorite Shows to DVR! Just to clarify, I did add beans to the bottom, and ham, fried eggs… But not MY beans and MY ham. Commonly, I cook Boston Baked Black Eyed Peas and Bacon, and in the Summer, BBQ my hams. Damn good, and a Boca Breakfast like that would really Pop! Tentatively. Thanks lots! You are quickly becoming my favorite cooking show on PBS. Far more entertaining than the rest, that is for sure. And everything looks so freakin’ good. I saw the episode on Saturday and decided “We’re going to have a Boca Breakfast Casserole tomorrow! So I made a big one with 7 eggs in it, lots of Ham and salsa and cheese. It’s was pretty darn good, though I didn’t have my beans or my ham. Does it turn out better in the individual containers? Mine are ramekins. This has been a good season! Wonderful job to you and the crew. Thanks, Carl! It comes out just as good in a big casserole or small ramekins… but do add some beans! I was wanting to try this. Are you supposed to use 2 slices of ham per individual dish? Yes, exactly. If the ham slices are too big or thick, you can opt for one.